Learning Goal: In this lesson, you will learn the simple and perfect tenses, the present tense, and the progressive tenses to help you use verbs correctly in your writing. 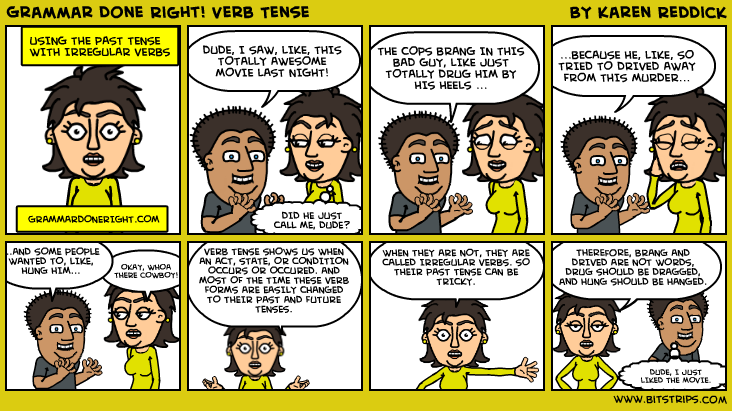 The tense of a verb indicates the time in which the action or state occurred. The simple tense express actions or states of occurring at an indefinite time in the past, present, or future. I played violin. I play guitar. I will play guitar. The perfect tenses allow you to indicate more precise time relationships. The present perfect (has or have + past participle) expresses an action or state that was completed (or perfected) at an indefinite time in the past, but still applied in the present. It can also express actions or states of begun in the past and ongoing in the present. The past perfect (had + past participle) and future perfect (will have + past participle) expresses actions or states that were completed before some specific past time, or will be completed before a specific time in the future. Examples: past perfect: By age twelve, I had attended eight different school. future prefect: As of July, I will have been in school for thirteen years. To express a future action or state: "I leave for college tomorrow." To express a general belief, scientific truth, or customary or repeated action: "Sheila soon discovered that love is blind." "Craig Davidson wrote Cataract City, which is set in Niagara Falls, Ontario"
Progressive tenses indicate a continuing action or state. All of the simple and perfect tenses have a progressive form. The progressive tense is formed by combining the verb be with the present participle. Present Progressive: Sara is feeding the birds in the park. The birds are cooing in appreciation. Past Progressive: The sun was burning my skin. The horses were galloping across the fild. Future Progressive: The presentation will be starting soon. Present Perfect Progressive: I have been living here all my life. He has been living here all his life. Past Perfect Progressive: We had been waiting for days. Future Perfect Progressive: Sally will have been working for six hours by the time she finishes her shift.